Many visitors ask, “Why was this tiny architectural jewel built here and hidden from the world?” The answer is simple. It was not built for the world to see, but for the seminarians of St. Joseph’s College to use; a holy classroom to train young men for the priesthood. St. Joseph’s College was commissioned and operated by the Vincentian Fathers, members of the Congregation of the Mission founded by St. Vincent de Paul. Built in 1914, the seminary had no chapel. For nearly a quarter of a century, candidates recited their prayers in a large, unadorned room. The Chapel, designed by F. Ferdinand Durang & Son and completed in 1932, incorporates both traditional and English Gothic elements. With a single nave leading to an elevated altar capped by a beautiful wrought iron baldacchino or canopy, the chapel features 18 altars where priests and seminarians celebrated daily Mass. 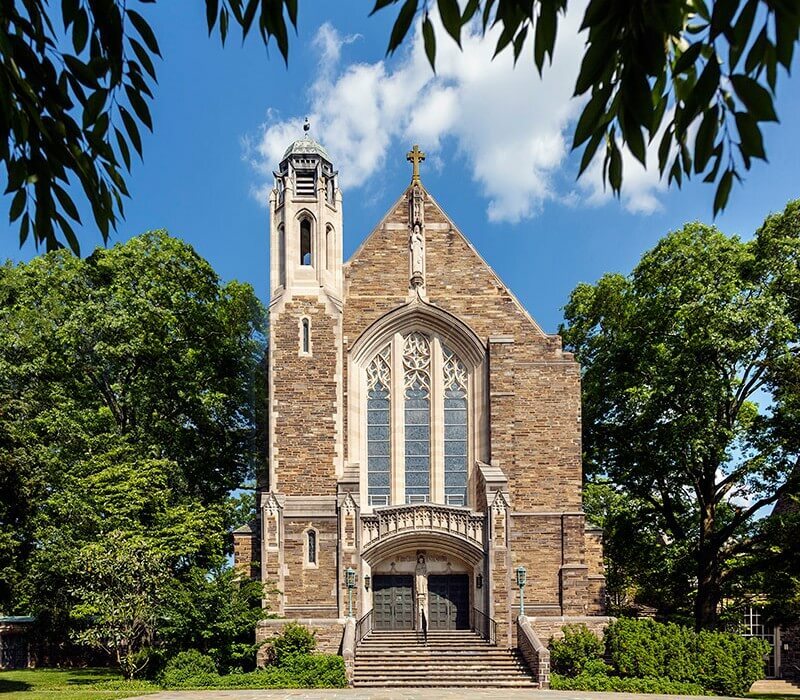 Princeton Abbey’s stained glass windows were created by Nicola D’Ascenzo, a world-class craftsman who studied throughout Europe. Their striking blue coloring, called Bernardini Blue, is similar to the famous stained glass windows of Sainte Chapelle in Paris and of Chartres Cathedral. Nicola D’Ascenzo’s work is collected and featured at art auctions, and his stained glass still bathes admirers in colored light all around the world. Famous commissions include: The Seven Ages of Man Window in Shakespeare’s Folger Library in Washington, DC; multiple windows in the Washington National Cathedral; windows in the Cathedral of St. John the Divine and Riverside Church in New York City and windows in Princeton and Yale University chapels. For Philadelphians (as well as anyone crossing the Delaware River on the Benjamin Franklin Bridge) perhaps his most familiar work is the “Nipper” window in one of the old RCA-Victor buildings in Camden, NJ, now refurbished as a luxury apartment building, The Victor. View or download U.S.1 Newspaper’s cover story of the Princeton Abbey here.